It is definitely the hardest to choose shoes, especially in the summer. Shoes should not be decorated with chains, beads, pebbles, studs and other elements, or are acceptable if they are almost invisible. Color toned. Often gentlemen choose classic black, brown, gray or blue. Shoes should also be covered and not too shiny. Of course, one should remember about the purity and character of the shoes, that is, fitting the occasion and the rest of the dress. Even covered sneakers will not match the suit. Footwear should complement the outfit, but when they are perfectly matched, they can even distract attention from other imperfections in clothing. And finally, the comfort and comfort of walking is very important, which is why in summer attitudes on natural leather footwear that will allow your feet to breathe. It is also worth investing more money and enjoying professional appearance, good quality materials, so that shoes will serve us for several years. The Betelli brand offers to its customers high-heel shoes for men about 7cm made of natural leather. Raising forces a straight figure and adds self-confidence at work or at a business meeting. So what men's shoes to wear for work? The most important is the profession and the requirements of the garment, i.e. in what extent it is to be formal. For men who need to wear a business suit every day, shoes in brown or black, covered and preferably matte or with a slight gloss will be wonderful. The ideal will be leather, artificial materials only enhance the sweating of the feet, which is particularly important in the summer. 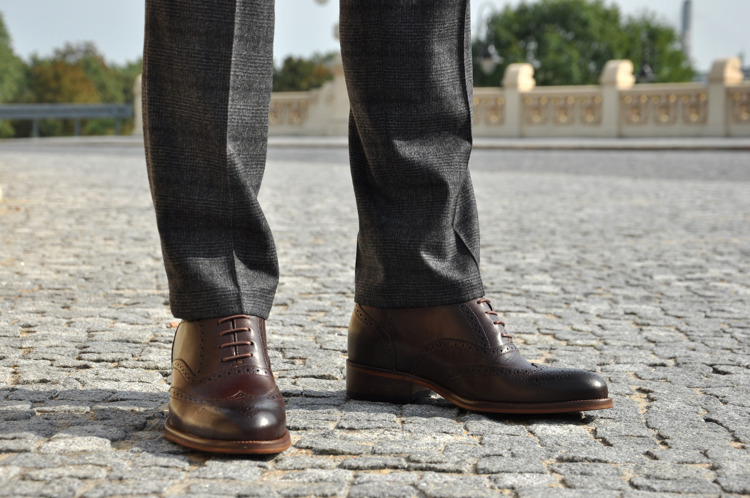 It's good to choose socks that are long and you should choose those in a darker color than trousers. It is not a good idea to put on flip-flops, sneakers or sports footwear. It's best to put on a classic or black shoes without ornaments, elegant holes are allowed as in the Bari model and the upper model Soto (closed or open). However, in a work where the dress code is not so restrictive, you can "splurge" a bit and put, for example, loafers with a more formal character, on a bare leg.